The Hedgehogs around here seem to be vanishing at an alarming rate. This time last year I had two three Hedgehogs in my care. I currently have no Hedgehogs in my care at the moment. I don't know if that is a good or bad thing. I saw a Hedgehog the other Day, dead at the side of the road- in my village. This has happened so many times. I once found one dead just opposite our house, one that may have been coming to feed in our garden. Is the population in my village vanishing because of road traffic? This is something I have noticed happening this year, and I know that many may be in Hibernation now. I think I'm starting to see the numbers here falling- rapidly. I don't have any at the moment either. Only today I spoke to a couple of people about hedgehogs they see in their gardens at night. In science we have been learning about 'cloning'. Basically, Scientists can clone certain animals, like when they cloned 'Dolly' the sheep. They did this by doing something with the nucleus cell. On the news this morning, it said that Scientists believe that they can clone the Woolly Mammoth despite the important cells being frozen for thousands of years. This means that they think they can 'bring' woolly mammoth back. I'm telling you this because, if you think about it, if what they are saying is true, it means that no species of animal can die out- if they can bring the woolly mammath back, then if it ever gets to the point were Hedgehogs are nearly gone, could they not clone Hedgehogs? But as if the answer is that simple! They may have already cloned animals, but what about breeding? Surely the breeding will be very poor, as well as other problems. If they were to bring the woolly mammoth back, where/how would it live? The climate surely is different, as is habitat. Cloning seems wrong to me, we are all unique, all individuals and this includes all animals. A tough subject in some ways. It is wrong, in some ways. But if the Hedgehog was to become extinct would cloning be the answer? 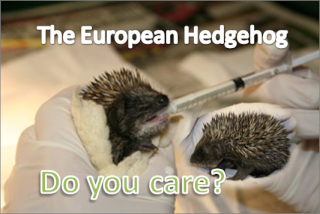 If the Hedgehog was to vanish- would you be for or again cloning the Hedgehog that we love, so that it is no longer extinct? How about that for a question! I have also noticed that there are less and less Hedgehogs around. It is getting to the point where more people need to do something before it is too late. Today is Bonfire Night, and yet another danger to the Hedgehog. I have not noticed more of a change...yet. It has to be said though, there is no doubt that their number are dropping. I've found them in my garden couple times over the years,but unfortunately i had to relocate them each time to a nearby shrubbery on edge of playing field because i have a dog.Im sure he wouldnt hurt them,but he's very curious of small things and i dont want his hooter getting pricked or the hog to get hurt should he ever retaliate. Thinking now though,Vegas (my dog) very likely wouldnt take any notice of hedgehogs because he's so laid back,but i now have chickens who freerange my garden.Anyone know how chickens get along with them? I would imagine a chicken would have a look at a hedgehog, one attempt at a peck and that would be it - having said that chickens aren't all that bright so who knows! !